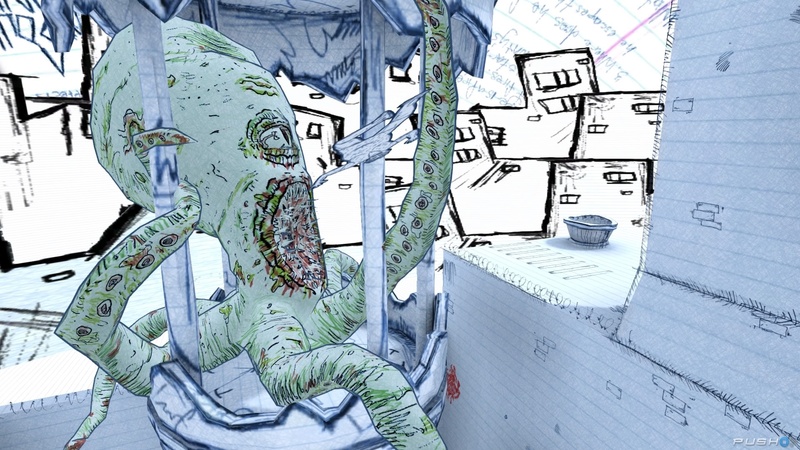 There’s a lot to like about Drawn to Death, a game developed by The Bartlet Jones Supernatural Detective Agency. 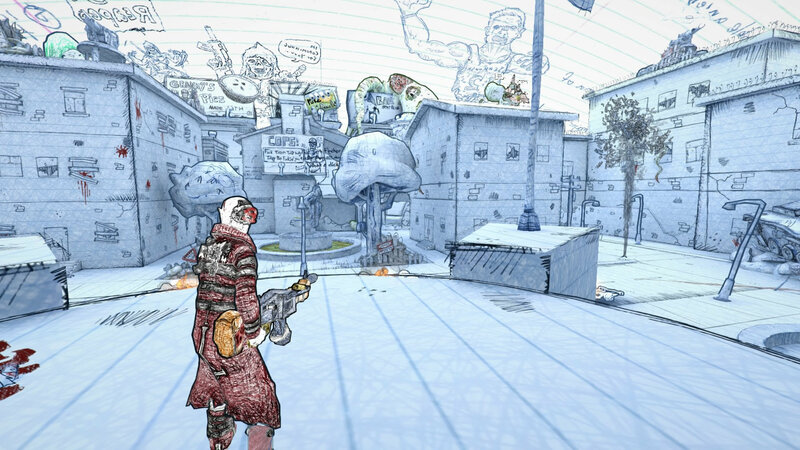 First and foremost, Drawn to Death feels like a throwback to games like Twisted Metal fused with Quake. Funnily enough, David Jaffee, the creator of Twisted Metal and the God of War series, is actually the one responsible for this angsty artsy fantasy. This online-only shooter is filled to the brim with massive amounts of quirk and profanity. In contrast, the sketchbook art style that leaps off the pages into this nightmarish three-dimensional landscape creating a striking and fresh experience. While the bloody gore and over the top frenetic action make it a head-spinning ride, the character designs give it a quirky edge. For example, we have a Little Mermaid reject with a head of a shark and body of a voluptuous lady named Ninjaw. Then you have Alan, who lugs around a massive chainsaw that would do Ash from The Evil Dead franchise proud. Each character has their own unique traits, like Ninjaw, who can use her special powers to anchor enemies in place. On the other side of that spectrum, Alan can toss his chainsaw across the map for serious damage, only to fetch it so he can use his special ability titled the Flying Death. The amount to learn from each character leaves a lot of variation in matches. Especially when each character has a weakness to another, so team balance is key when joining the fray. By the end game, you’ll need plenty of practice in order to understand how each weapon and character works to their best potential. In deathmatch, you’ll be gaining two points for a kill but losing one for a death. How so? Well, let's say you’re about to be down and out from the match way too soon for your liking. Using the Drawn to Death system, you can be skyrocketed to the top of the chart and turn your loss into a skin of your teeth victory. Like most multiplayer titles, if your team is bad you’ll be unfairly punished, which halts your progress and can be frustrating when you want that next weapon unlock. Blood is then calculated at the end of the round where you’re given keys to unlock one of the 20 insane guns. Or you can just pay for the whole shebang upfront and get them all unlocked with real cash. In addition to the massive variety of weapons, you collect Mystery Boxes, just every online multiplayer shooter out there. These Mystery Boxes house cosmetic items such as taunts or costumes and you’ll be wanting the juvenile taunts to rile up the enemy after a well-deserved victory. Overall, I found the taunts and jokes in Drawn to Death to be a guilty pleasure charm. Although, I can also understand how they may turn casual players off. Right now the game is free for PS Plus members for the month of April, but once that honeymoon is over, will there be enough meat to keep them coming back for more? I think so. Drawn to Death reminds me of another hilariously fun and exciting third-person shooter, Loadout. Loadout had very similar sense of style in terms of its visual comedy and play mechanics. Unfortunately, the player base ran dry, and the PS4 isn’t a slouch when it comes to multiplayer games vying for top dog. I want Drawn to Death to learn from Loadout and have longevity. After all, the game has style, jokes, fun character designs, interesting weapons, and frantic action. I also like the current price tag of "free," but even when the game goes back to it’s original $20 MSRP I would recommend it. I believe there’s enough character/world design and gameplay that can make it one of the standout third-person shooters on PS4. As for right now, you’ve got nothing to lose if you’re a Playstation Plus member and a lot to gain if you’re not. 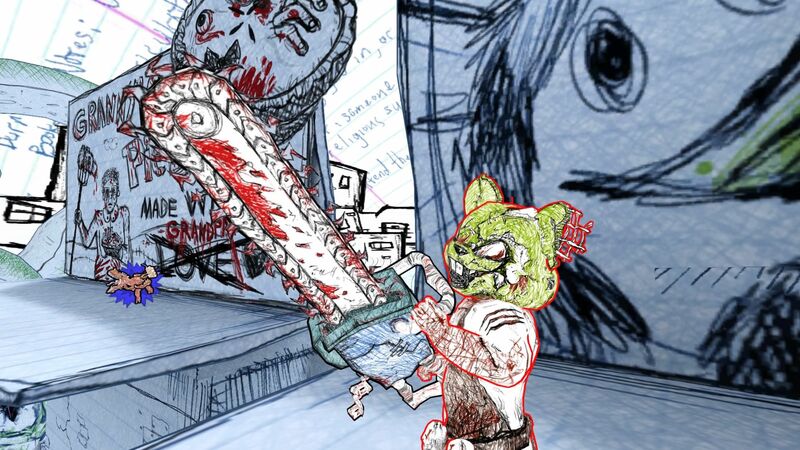 Do you like the art style in Drawn to Death? Do you see yourself continuing to play when Destiny 2 comes out? Comment below! For more features here at IndieObscura, be sure to check out our first edition indie tabletop roundup, learn how the mobile game Sea Hero Quest is giving back to Alzheimer's research, and check out the unique way these indie bands are turning their albums into indie games!